Recently, I was at the Exploratorium in San Francisco and I saw an exhibit that was a little out of the ordinary. The Exploratorium is a kind of science museum filled with experiments and practical learning tools, but this exhibit was on the human mind, and it was just a poster. Notice anything in particular? We perceive the wealthy to be much less wealthy on aggregate than they actually are. The inequality in this country is far greater than people imagine. Get mad, or get even? Now I am sure there are many who see that and feel anger or resentment. I have to admit, I felt a bit of it myself… and I took the opportunity to renew my voter registration. People have been duped! At the same time, I felt motivated. If this is the society we live in, then it’s incumbent on me to try to better myself and make the opportunities I need to build wealth and take care of myself in the future. 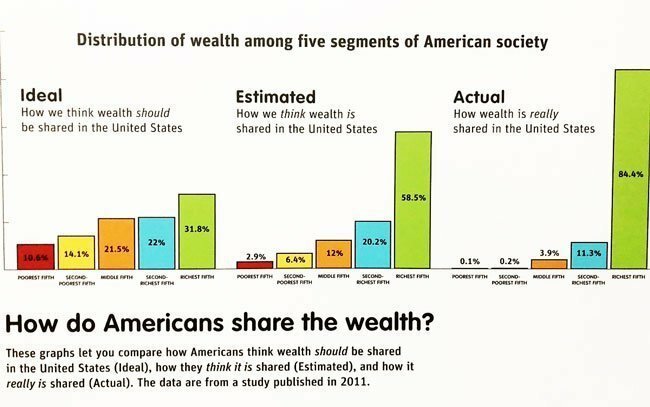 It only makes sense that those of us in the bottom 80% should take the opportunity to build wealth in whatever ways we can, and start acting more like wealthy people. Social security is a lifeline we may not be able to afford in the not too distant future, so we are all responsible for building a nest egg large enough to support us in retirement. Everyone has a different way of thinking about their finances, and to tell you the truth there is no right or wrong method. However, there are common themes among people who run their finances effectively. First of all, they have a budget. They understand how much money is meant to come out of their account every month, and how much should go in. Second of all, they know where they stand. At any given moment, they can tell you exactly how much money they have in their account, AND whether or not that is enough to pay for their expenses. Third, they separate out discretionary expenses from non-discretionary. In other words, their mortgage and car payments are paid from an account that ISN’T the account hooked up to their debit card. This way. there are no surprise overdrafts. I write more about setting a financial foundation in this post. The biggest mistake people who aren’t wealth make is thinking that $500k or $1m is a lot of money for retirement. Of course, that is a lot of money, but it will only provide for a relatively modest amount of income in retirement, especially when you consider the costs of healthcare. A $2m portfolio at a standard 4% withdrawal rate equates to $80,000 per year. That’s not bad money, but it isn’t going to cut it for most. Wealthy people understand that life is expensive and that living off of investments requires a healthy nest egg. Take a look at my interactive calculator to figure out how much you will need to retire. It should come as no surprise that it’s easier to save a large amount of money if you make a large amount of money. A lot of people want to jump into investing right away, and will spend days and weeks pondering ways to increase the value of their holdings by 1-2%. But, this isn’t what wealthy people do. They focus on growing their income as much as possible before they spend their time worrying about investment returns. The logic simple. If you are making $100k and you save 10% of your income, you are saving $10k per year. If you are making $30k you need to save 33% of your income to match that. Because of this, most people should spend their 20’s learning and gaining skill in their job to increase their odds of promotions and raises. Then, they will hopefully be nearing their peak earnings by 35-40, and can spend those years aggressively saving and working on their investment strategy. Of course, it’s vital that you save in your 20’s as well, I am just saying that there is more value in the long run in increasing income during your 20s and early 30s than worrying about which stock fund to be in. Use a target date fund instead, then start a side hustle or go to business school to raise your income and potential savings. Also, keep in mind that the majority of millionaires are self-made. It’s difficult to get ahead working for “the man”, so remember that starting a business is often the quickest way to real wealth, provided you are willing to put in the effort and the business idea makes sense. If you haven’t already started investing, it’s important to approach it like a wealthy person. You shouldn’t just rush into investments or individual stocks because they seem like good investments at the time. Great investors take a much more measured approach. First, you need to figure out what your goals are, and what your risk tolerance is. Then, you need to understand the world of investments that are open to you so you can effectively diversify. Only then will you have the information you need to build your portfolio. Remember to choose passive investments, like nearly any fund from Vanguard or SPY, the ETF that tracks the S&P 500. This will ensure you don’t lose too much money in one stock and you will be able to benefit from long term market appreciation. Whatever your stance on inequality, there is no doubt that we all have levers at our disposal to try to better our own situation. Some have better levers than others, but at least the knowledge for how to treat money prudently and invest well is available online. Take advantage of it and start laying the foundation for success down the road. Republished with the permission of TheFinanceTwins.com. When I realized I already was a millionaire i.e. was doing the actions it required for me to become a millionaire, all the anger, stress and frustration melted away and I simply got on and did the work. Not only with this realization did i achieve my financial goal 15 years earlier, since then I have gone on to achieve much more while balancing a lifestyle with continued financial security and most importantly helping others. I think there are many ways to get wealthy. I believe learning from a wealthy person (or a group of wealthy people), especially how they think, helps provide insight on different paths to wealth. I grew up poor but is a self-made millionaire before the age of 40. I find it best to not look at wealthy people as enemies. There is no reason to be mad at them. There is also no reason to want to get even (get even for what?). I view wealthy people as proof there are endless opportunities in America to get rich. The opportunities are all over the place in America. You need to have the mindset of saying I can be and want to be wealthy too and then lay out a plan to get there.